Home / Blog • Headline • Results / Staffs 70.3, Leeds and Cotswold 113……. Staffs 70.3, Leeds and Cotswold 113……. The race results continue to come thick and very fast for the GS team. Last weekend Leanne, Nige, Mark and Fran were lining up at IM Staffordshire 70.3, George at the Olympic distance GB age group championships and qualifier in Leeds and Laura and Simon were in action in the Cotswold 113 as they both continue to build towards IM Copenhagen in August. George was first to go despite the fog hanging over the water which delayed the start of the other 2 races. A solid swim, 1hr bike and an excellent 36min 10k to finish had George racing amongst the top athletes in the race and he secured a top 25 finish in a loaded field and high enough in his age category to guarantee a qualification slot for the European champs next year – a great result. So a bit of time to find the odd minute of extra speed in the swim and on the bike and George will be in medal contention. At Cotswold 113 Laura and Simon had to wait for the fog to clear before the race could get underway. Both had excellent swims. Laura executed her bike leg brilliantly – building into the second half of the bike leg being mindful of her recent knee niggles. This approach paid off really well meaning that she finished the bike strong and ran an excellent half marathon to finish in 5hr48min – first time under 6 for a half and top 15 in her age group – a great performance. Simon knows he has the run form and pushed the bike hard producing an excellent 2hr40ish bike split followed by a solid run to finish in just over 5hr30min – job done! So on to Staffs. Head coach Fran unfortunately had to pull out before the start having picked up a bug in the days before the event but Leanne, Nige and Mark all had excellent races. 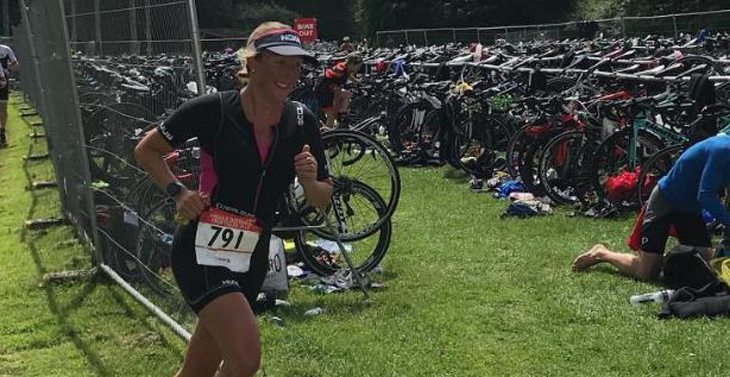 Leanne’s continued rise through the ranks was in evidence – in a very competitive age group, Leanne produced her best swim to date and then began to chase down the leaders on the bike – after the 30km mark she was up to fifth and moving faster than all the athletes ahead of her. So it came down to a foot race and Leanne ran well to a 1hr41min half marathon, 5hr10min finish in 5th place with only 10mins separating the top 5 and in the top 25 women overall including the pros. That podium place will be along very soon! Mark Holmes raced brilliantly in his first ever half ironman event, His swimming has improved massively resulting in a 37min which he followed up with an excellent 2hr49min bike split on his road bike and a very solid 1hr43min run for a 5hr18min finish. Lots more to come from Mark – especially when he gets his hands on his new tt bike J Nige, despite some recent issues in training, had an excellent race recording a new best time for a half ironman. Really pulled it out of the bag on race day and showed his competitive edge. Loads more races to come for Nige this year as he builds toward the summer. Finally, Marianne ran a 1hr49min pb in the Yeovil half marathon and followed it up with 3rd female on the Wessex Wizards aquathon om Saturday.